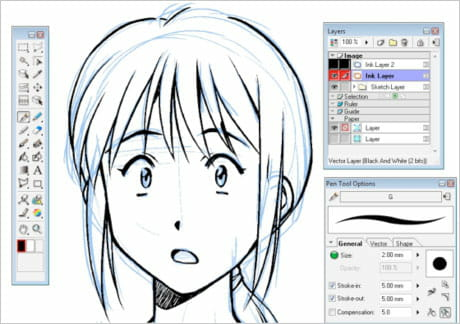 Manga Studio EX is a software designed to draw images like famous Manga cartoons. It supports importing many types of format such as BMP, JPEG, PNG. Creating: Manga Studio EX was mainly designed to create comics, illustrations and especially Manga cartoons. For that, it provides all the standard tools to draw images like pencil, brush, eraser and many others. Smooth option: this function is surely the one that makes this tool stands out from others. Indeed, it is possible to adjust the size of the drawing tools and apply smooth and water effects to make it more realistic. Templates: Manga Studio EX proposes a large range of templates in its library. They can be used as a model and are fully customizable. Supported formats: this software supports almost all the popular format like PNG and JPEG. But also, it can deal with the recent ones such as PSD, TGA. It also includes a scenario editor to plannify the whole story before the drawing process. Manga Studio EX proposes more than 3.000 templates in its library. It allows importing 3D objects and inserting them into the story. Latest update on March 16, 2015 at 02:56 AM.